Today’s word is “Wizard” sent to us by George! On today’s show, Mat creates bewitching names for a wizardous game, Dan justifies his love of Clippy the paperclip, Andrew rips fat clouds with Gandalf The Dank, and Mélissa pinches owls. We also enjoy some ridiculous voicemails along the way. The song at the end of today’s show is from The Wizard Of Oz! New episode will be up next Thursday! In the meantime, enjoy this extra! This little tidbit was recorded about a year ago as a sound-check before a full episode of the show. In it, Mat and Andrew talk about the times they saw cars moving on their own. This week’s word is “Casino” sent to us by Meghan! Today we celebrate Mother’s Day with the legendary Shelley – Mat’s Mom! Laugh with us as she reveals her insane theory about the security cameras at the casino, recalls the time she accidentally said something racist, gives us the definition of “Gretzky vision”, explains how she played a game of 15 Love at a truckstop, and tells us the nitty-gritty details of the time she saw two people doin’ the nasty at a pizza joint. The song at the end of today’s show is The Gambler by Kenny Rogers! Since then, Mat has been experimenting with Snapchat, and he’s had a surprising amount of fun with it. Let this compilation of Mat dicking around on Snapchat serve as an admission of “I was wrong”. Want to join in on the stupidity? 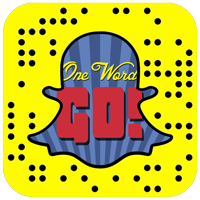 Follow onewordgo on Snapchat, or take a picture of the snapcode below in Snapchat to add as automatically! Today’s word is “Secrets” sent to us by Ian N! Today’s show kicks off with an intro courtesy of Adam and Bryon of Everyone Has A Podcast! After, we play a game of “Two Lies and a Truth”! Is Dan really a master of Karate? Has Andrew scared off a prostitute just by looking at her? Did Mat hide a stolen muddy toothbrush in a bus? Was Mélissa lying about stumbling upon a dead body!? Find out all this and more, when we air our dirty laundry on today’s podcast! The song at the end of today’s show is called Secret by The Pierces!